Running with Zithers........: Zither Magic! Now that we subscribe to "ZITHER GROUP OF THE AIR"
As part of the 2015 Birregurra Festival, we launched our 'Zither Group of the Air' on the weekend. A long-distance zither group, taking full advantage of the old notation system and tune-sheets, originally sold with zithers, almost 100 years ago. This launch was driven by the interest in antique chord zithers, fostered by an article in The Weekly Times, a couple of months ago. 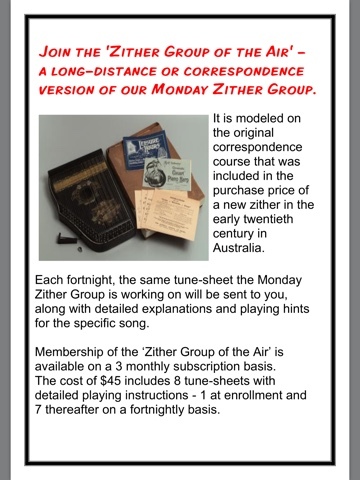 But, just like the original tune-sheets, this Zither Group of the Air is simply an 'old idea' reborn, as the purchase price of a zither often included a long-distance course in the form of monthly lessons, that would arrive in the post. And with this, I declare the 'Zither group of the Air' up, up and away!